Celebrating 40 years of clogging in 2019! The new session will start in Fall 2019!! Classes meet at the Wayne County Fairgrounds in the Fair Board Building, (circled in red on this map) and are open to adults, and youth 7 years or older. You will learn couple mixers and line dances, and you do not need a partner to join. There are no classes on the 3rd Monday of the month due to Fair Board Meetings. A hard soled shoe (with or without taps) and comfortable casual clothing are recommended. The Cedar Valley Cloggers try to maintain the traditional style of clogging while dancing to old time fiddle tunes. We are a performance traveling team and our club has been together for over 35 years. 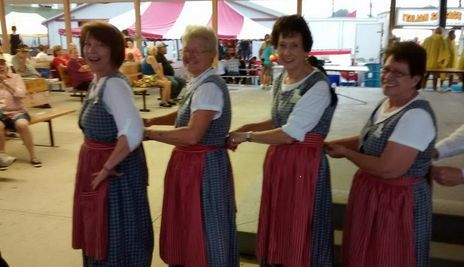 Let the Cedar Valley Cloggers teach you how to tie aprons! This fine tune Is "Dance All Night", played by the Dixie Playboys and recorded in the 1940's.